To order click on the image above to enter the NuVet e-Store link. Call 1.800.474.7044 to order directly. We love dogs and provide our dogs with the best nutrition possible. Just as people need to take vitamins, so do animals. We give and highly recommends giving puppies/dogs or even if you have a kitty NuVet Plus for Canines and NuVet Plus for Felines. And for your senior dog NuJoint Plus. Unfortunately, the majority of dogs and cats are not receiving a complete, healthy diet and many become ill and die prematurely. NuVet Labs main purpose is to help increase your pet's longevity and quality of life. NuVet Plus for Canines and NuVet Plus for Felines products, provide the very best human-grade, natural ingredients available and utilize the latest advances in medical, veterinary and nutritional science. They pledge to adhere to the highest standards in products and services. 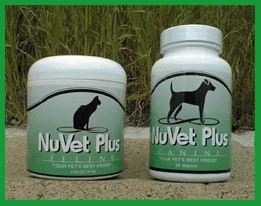 Their goal is to maintain a lasting and caring relationship with NuVet Plus customers and the pets they love. PSS Web Dezinez puppies and dogs get all natural, human grade NuVet Plus for Canines every day in order to maintain overall good health and strong immune systems. Providing vitamin supplements to your puppy/dog's food will save you a bundle in vet bills. Some dogs will take it as if it were a treat, for others you can mix it with their food. NuVet cannot be purchased in stores but by clicking on any of the images on this page or on the front page of this site you can order through the NuVet e-Store link. If you have difficulty with the e-Store, Call 1.800.474.7044 to order directly. Give the operator the Discount Code #64017. NuJoint Plus is a natural anti-inflammatory hip and joint therapy, formulated with the finest pharmaceutical, human grade ingredients. Major considerations in formulating NuJoint Plus were the pharmaceutical grade quality of ingredients and their healing values, as well as the bio digestibility and utilization into the cellular framework. NuJoint Plus has been formulated by leading Veterinarians and Scientist to contain precise percentages of Glucosamine, Chondroitin, Methylsulfonylmethane (MSM) and Vitamin C which will help to quickly and effectively reverse and heal the devastating effects of osteoarthritis. NuVet Labs has designed a cutting edge formula that we believe will help increase your pets longevity and quality of life. Our scientists performed extensive research and experiments with the ingredients in NuJoint Plus, finding the most powerful synergistic defense against the harm caused by osteoarthritis. and are not to be taken and used elsewhere without permission.